This second look at the Crucial MX500 reinforces our opinion of it as a solid performer, but it definitely isn't the fastest TLC SSD around. It is more common to find the MX500 placing second or third in its class on the performance tests, which isn't a problem if the price is right. The 500GB MX500 is clearly slower than the 1TB model, and at first glance its performance relative to the competition is not as impressive as the results from the 1TB model. The 500GB capacity class is starting to become the default choice over smaller sizes, but it is no longer big enough to offer full performance even on drives that are limited by the SATA interface. On the other hand, the per-die capacity of the MX500's 64-layer 3D TLC is actually lower than that of the 32L 3D TLC used by the MX300, so the 250GB model shouldn't be as handicapped as the smallest MX300 was. Since our first look at the Crucial MX500, the Samsung 860 PRO has raised the bar again for SATA SSDs. However, it exists in a price bracket that has been taken over by NVMe SSDs, so it isn't really serious competition for mainstream SATA drives. It is the TLC-based 860 EVO that will really matter. Samsung has clearly refined both their controller and their NAND, and we expect the 860 EVO to improve over the 850 EVO in both performance and power consumption. When the dust settles on this round of product launches, Crucial will probably once again be in the position of offering a slower but cheaper option than Samsung's mainstream SATA drive. But this time around, the performance gap will be much smaller, and the MX500 comes with far fewer caveats than the MX300. The MX500 doesn't have serious performance problems when full like the MX300 and many other entry-level SSDs. The warranty and write endurance ratings are decent, and the MX series still matches Samsung's SSDs for features like drive encryption. Crucial and Samsung are both making quick transitions to their new models: the MX300 and the 850 series SSDs are starting to go out of stock and their prices are climbing. The full range of MX500 capacities are now mostly in stock, as are most of the Samsung 860 PROs and EVOs, and they're all still pretty much stuck at MSRP. Even at MSRP, the Crucial MX500 is priced to beat all the other SATA SSDs using 64L 3D NAND, and it more or less matches the older and slower models that are still available. Other SSD manufacturers don't seem to have fully reacted yet to the Crucial MX500's pricing. The Western Digital WD Blue 3D/SanDisk Ultra 3D is almost as fast as the MX500 and almost as cheap, so it's a good product to keep an eye on, but not the one to buy if you're buying today (except at 1TB, where the Ultra 3D is $10 cheaper). The Intel 545s uses similar NAND and controller to the MX500 but usually comes out slightly ahead. However, Intel hasn't been pricing the 545s very aggressively and they haven't released 1TB or 2TB capacities. Toshiba's DRAMless TR200 is barely a presence on the market with only the 240GB model in stock and at a price no cheaper than mainstream drives. 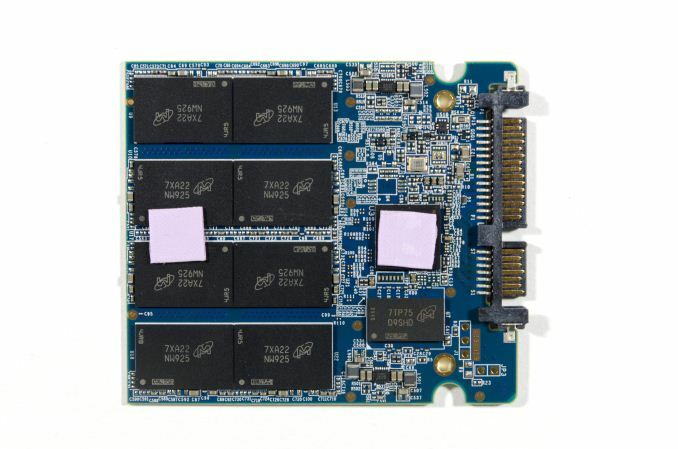 The many other brands that don't manufacture their own NAND flash are using the 64L 3D NAND they can acquire for PCIe SSDs, so the rest of the competition for the MX500 is last-generation SATA drives. The only caveat to that recommendation is that power efficiency has taken a step backwards with the MX500, while Samsung appears to be setting new records in that department with the 860 series. We expect our upcoming testing of the 860 EVO to show it using less power than the MX500 and probably offering slightly better performance. But at the moment it looks like those probable advantages come at a pretty steep premium.